Lost Landscapes of Los Angeles is an experimental documentary tracing the changing city of Los Angeles (1920s-1960s), showing how its landscape expresses an almost infinite collection of mythologies. 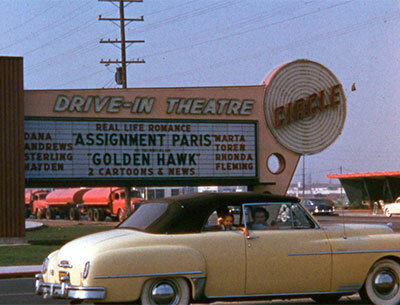 Made from home movies and studio-produced “process plates”—background images of the city shot by studio cinematographers for rear projection in feature films—Lost Landscapes depicts places, people, work and daily life during a period of rapid urban development and showing the life and growth of the United States’ preeminent Western metropolis as the sum of countless individual acts. Lost Landscapes of Los Angeles is the latest of Rick Prelinger’s “urban history film events,” featuring rediscovered and largely unseen archival film footage arranged into feature-length programs. Unlike most screenings, the audience makes the soundtrack — viewers are encouraged to identify places, people and events; ask questions; and engage with fellow audience members. While the films show Los Angeles as it was, the event encourages viewers to think about—and share—their ideas for the city’s future. What kind of a city do we want to live in? Rick Prelinger is an archivist, filmmaker, and educator. He is Professor of Film & Digital Media at UC Santa Cruz and is a board member of Internet Archive. His films made from archival material have played at festivals, museums, theaters and educational institutions around the world. Lost Landscapes of San Francisco (11 episodes, 2006-2016) plays every autumn in San Francisco. He has also made urban history films in Oakland and Detroit, and is currently producing a New York film for a late-autumn premiere. For one special evening, Rick Prelinger will take the HFA audience on interactive journey through cinema’s most infamous city. And join him again the following day as he gives Houghton Library’s bi-annual George Parker Winship Lecture. This event is co-sponsored by the Harvard Film Archive and Houghton Library.